Need a cute birthday gift? Check out this project! Use the page of white circles and the black background. Using those circles, cut out a figure eight shape, making sure to leave the circles connected to make your mini notecards. Score and fold the figure eight into a mini notecard. Punch out as many stars as you desire, in two different sizes. Use the small hole punch on the stars and string them onto a piece of twine. Wrap the twine with stars around your jar and tie it off. 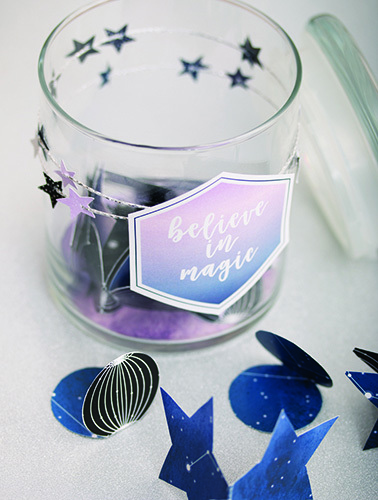 Cut out the “believe in magic” tag and cut out the hexagon shape. Glue the hexagon on top of the point where you tied off the twine. Perfect to give as a gift or just because!